When choosing a new opener system to install on your garage door, there are several factors you need to consider. There is a wide range of designs on the market, each with their own specific specifications and capabilities. Nobody ever likes to overspend, but it can also be just as much a problem if you go for a model that is below the standard you should accept. Here we take a quick look at some of the most important features that garage door openers can as well as some of the leading brands in the market. This is an important aspect if you suspect you have a particularly heavy door that will require certain amounts of power to lift. Many modern designs manufactured by popular brands like Liftmaster, Craftsman, Sears or Genie, will have motors that can generate 3 / 4 horsepower or more. This might seem a bit extreme, but you can be surprised how hard some doors are to maneuver. Picking the right power capability is essential. Get it wrong and you could damage the opener as well have a door that doesn't work effectively (or at all). We help customers make the right choice by assessing the weight of their doors for them before suggesting the models that have the appropriate type of motor and drive system. Going with well-known brands like Chamberlain and Liftmaster are often seen as a safe bet. Not only can they offer quieter and smoother functionality than many other models on the market, they come added assurance that all the components used to build them are of the highest quality. 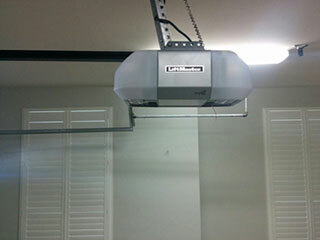 We have years of experience working garage door openers made by all of the credible brands mentioned above. We have the parts necessary to repair them and know the designs precisely enough to be able to promise perfect garage door opener installation every time. Call us today if you need help picking the right opener for you and want a professional to ensure it is installed immaculately.